Free Convert to MP4, 3GP, FLV, iPhone, iPad, iPod, GPhone, PSP,Blackberry etc. ...... MOV, etc. All popular video formats are added to the output profiles for your selection. And you can also custom lots of parameters. With TT Video Converter, converting videos to media player devices will be easy and efficient. You can convert videos to iPhone, iPod, iPad, BlackBerry, PSP, PS3, Zune, GPhone, Archos, iRiver, etc. and all kinds of mobile phone to watch them on the go. TT Video Converter also provides video enhance function. 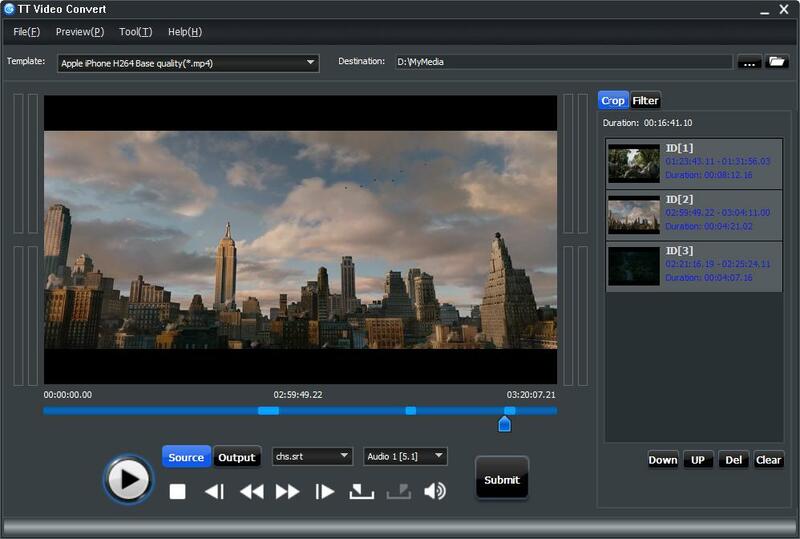 You will find many editing functions such as video cropping, movie trimming, and video effect adjustment (including resolution, subtitle, bit rate, frame rate, color, hue, brightness, saturation and sound channel, etc.). TT video converter, giving you the best video conversion experiences. Qweas is providing links to TT Video Converter 1.5 as a courtesy, and makes no representations regarding TT Video Converter or any other applications or any information related thereto. Any questions, complaints or claims regarding this application TT Video Converter 1.5 must be directed to the appropriate software vendor. You may click the publisher link of TT Video Converter on the top of this page to get more details about the vendor.